The blazing hot surface of Mercury, 400 degrees Celsius during the day, might seen an unusual place to find water ice. 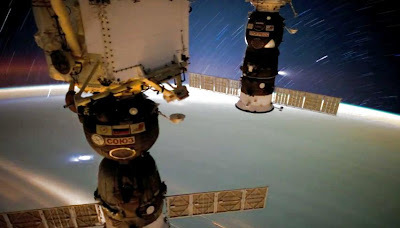 But nighttime temperatures drop well below freezing, and that planet also has no axial tilt so the Sun is always above that planet's equator and thus is very low on the sky when viewed from the planet's north or south poles. Which means that the bottoms of deep craters near the poles are permanently shadowed and never see any sunlight, and thus are very cold. Cold enough to cause any water vapor there to freeze out at the bottom of these craters. But Mercury is airless and waterless, so there should be no ice there, right? Except for when an icy comet happens to impact the planet, which would create a hot plume of water vapor, most of which will escape the planet. But a tiny fraction of that escaping vapor will find its way to the polar craters where it freezes out, so these polar craters are slowly accumulating cometary water ice over time. This expectation was recently confirmed by the Messenger orbiter at Mercury, which detected changes in the flux of neutrons from the planet's surface that is consistent with patches of water ice at the bottoms of these polar crater. Red areas in the above image of Mercury's north pole are the permanently shadowed regions, and yellow indicates where Earth-based radar imaging of this planet showed likely sites of water-ice deposits. For more information, visit the Messenger website for additional details. Follow this link to see another fantastic video of Space Station hardware in orbit above an amazing planet Earth. This movie was assembled by Knate Myers using video clips posted online by NASA's Earth Sciences and Image Analysis office. 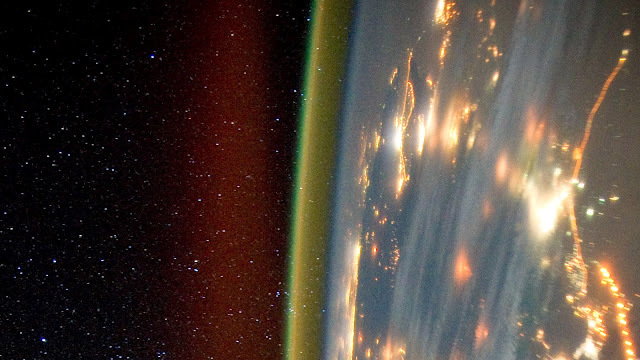 Follow this link to see a truly amazing video showing all sorts of atmospheric lighting that is seen by the astronauts onboard the International Space Station: aurora, lightning, city lights, and background stars rising through Earth's atmosphere. This must-see movie was assembled by Alex Rivest using video acquired by astronaut Don Petit; see Alex's blog for more details. 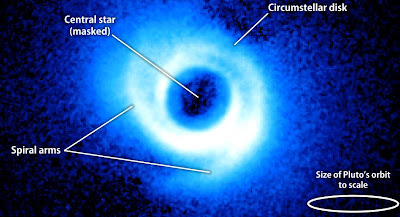 This image of a circumstellar dust ring was recently acquired by C. Thalmann and colleagues at the 8 meter Subaru telescope that the Japanese operate on the summit of mount Mauna Kea in Hawaii. Although the dust ring is nearly circular, the line-of-sight to the ring is oblique which makes the ring appear elongated. To reveal the faint ring, the astronomers must subtract a model image of the very bright central star, but imperfections in the star-subtraction results in the radial residuals seen in the image. Nonetheless the dust ring is still quite prominent despite those residuals, and its radius is about 80 AU. 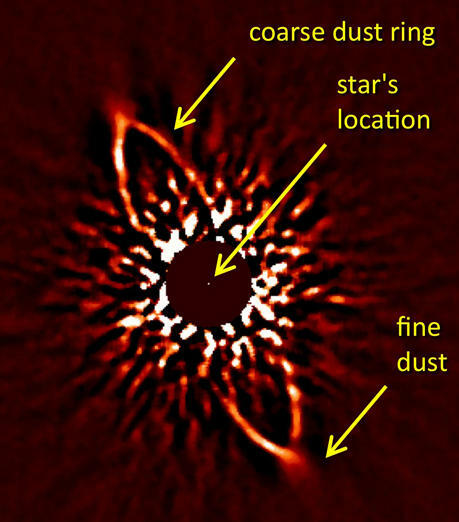 This dust is thought to be the result of collisions occurring among unseen planetesimals also orbiting within the ring. These planetesimals probably resemble the comets that inhabit our Kuiper Belt, which is the Sun's outermost debris belt that is of radius 45 AU. Another interesting feature of this image is that the dust ring's center is offset slightly from the star. Although the origin of this offset is uncertain, an unseen extra-solar planet is implicated, because its gravitational influence can displace the ring's center. But if there is an exoplanet here, it is too faint to be seen or is obscured by the residual starlight. For more information about this circumstellar dust ring, see this press release. This graphic shows a computer simulation of a circumstellar disk that orbits a young star, with each snapshot showing the state of the disk 1,500 years later. This disk is gravitationally unstable, which means that the disk's gravitational attraction for itself causes material to contract into spirals that can also clump up further to form Jupiter-mass protoplanets. The black circles in the above (click picture to zoom in) follow one such clump that first forms at a distance of 300 AU (ie 300 times the Sun-Earth distance) from the central star, which then spirals inwards due to its interactions with the disk. This simulation illustrates one of the difficulties in forming giant planets via gravitational instability, since the clumps that do form by this process also tend to get driven inwards by the disk, where they might accrete onto the central star. For additional details, see the preprint by Zhu and colleagues. This image of the disk that is in orbit about the young star SAO 206462 suggests that this disk might be perturbed by one or more unseen planets. This image was acquired at the Japenese Subaru telescope in Hawaii by Carol Grady (Eureka Scientific). 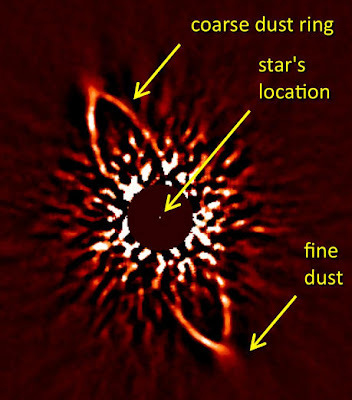 In this image, the central star is deliberately masked by the telescope's optics, which revealing a broad disk of gas and dust in orbit about the star. The size of this disk is at least twice the diameter of our Solar System. 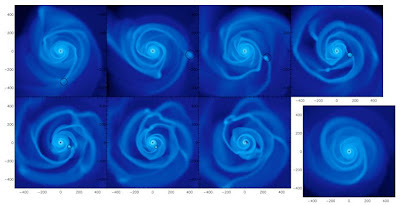 Planets are known to form in these circumstellar disks, and computer simulations of this process show that a young giant planet can also launch spiral density waves in such a disk. 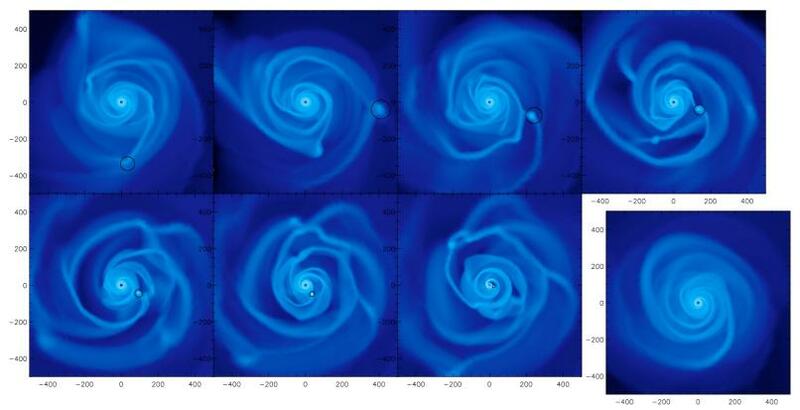 So this disk's spiral appearance does suggest that giant planets may have formed here. But keep in mind that this is not the only explanation. For instance, the gravity of passing star can also disturb a disk, and such a disturbance would wind-up over time and also resemble a spiral. But further study of this system may one day reveal whether the disk at SAO 206462 is indeed planet forming. See this press release for more details. This image is a computerized rendering of what a hypothetical observer migth see when looking obliquely along the mountains and craters on the giant asteroid Vesta. Of course the Dawn spacecraft is in orbit about Vesta, and thus is always looking down upon the asteroid, so Dawn would never see anything like this. But Dawn has now collected enough measurements of Vesta surface topography to assemble a detailed computer model of the asteroid's surface. With that model, one can then calculate the view that any observer might see when looking in any direction about Vesta. Keep in mind that Vesta is only about 700 miles across, so the more distance mountains shown here would not be seen by that observer; they'd lie below the horizon and thus would be hidden. But that computerized view can be adjusted to remove the asteroid's curvature (ie, flatten the asteroid) while preserving its topography, as is seen here. See the Dawn website for more details about this computerized image of Vesta's rugged surface.